Why should We, the people elect highly trained lawyers, usually among the best in their profession, to be judges if we are going to tie their hands with mandatory minimum sentences for any kind of activity We deem illegal? If the defendant pleads not guilty, a jury has the primary responsibility for determining the verdict – a judge’s primary responsibilities are keeping order in the court, instructing the jury on the law, and on sentencing. As long as minimum sentences are in place, I support commutation of every non-violent drug sentence, until sentencing guidance is back in the democratically-elected hands of our judges. In the power-struggle between statutory and judicial sentencing, we see again the tendency of legislatures to become regulation-mills, churning out laws year after year, until there are so many laws that no agency in government could possibly know or enforce them all, and thus all government agents will possess the very un-democratic power of deciding which laws to enforce. We reserve legal judgment to our judges, who are trained in legal principles, and charge enforcement agents only with apprehension powers. Law needs to be based on principles, not prescriptions, and it’s about time our legislatures started seeing their jobs as identifiers and coders of those principles which reflect justice, and ensurers of statutory adherence to those principles. When legislatures try to write a statute for every little instance of perceived injustice, the aforementioned proliferation of unenforceable rules combined with the certainty that some of those laws will be based on rank politics rather than justice, undermines not only justice itself, but popular confidence in Our justice system. Until political parties are relegated to their appropriate secondary roles in our political system, I’ll remain staunchly anti-partisan. Right now, electing a candidate to high office puts the political party she or he affiliates with into a position of power within that electoral region, and the balance of political power between the two parties that have won the vast majority of electoral posts since the American Civil War determines way too much about how political power can be exercised in our system in general, or by any particular official, depending on her/his affiliation. Political parties should be ideological lobbies; they should endorse candidates and exert their political wills however they legally may, but it should be illegal for them to control primary elections, and for candidates for office to affiliate with them. Just as it would be unacceptable for a candidate to be affiliated with, say, a meat-industry lobby, or a bank, or any particular business or organization. The power to govern us that we delegate to office-holders is too precious for us to allow such affiliations – they make politicians beholden to less than the whole nation, and the natural trend will be for these parties to work to consolidate their king-making power, to collude to exclude smaller competing interests, and to polarize our communities into unbending ideological zombies. Right! Many people have seen this clearly enough, but have misdiagnosed the causes, and many are still feeling their way toward some kind of diagnosis. One problem is that our economic language still doesn’t have the subtlety or precision to speak intelligently enough about it yet. 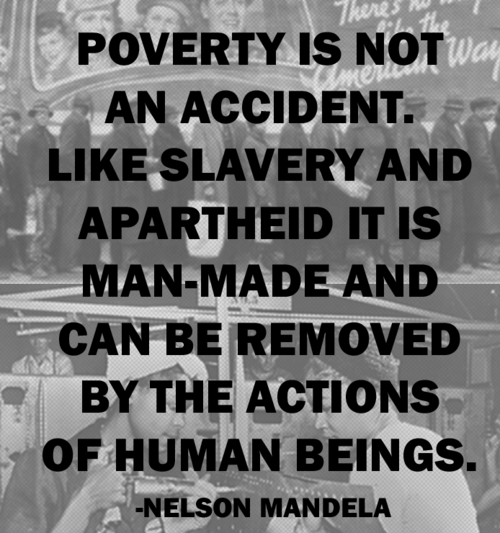 Mandela had a gift of cutting through a lack like that to the broad, simple strokes everyone could understand. 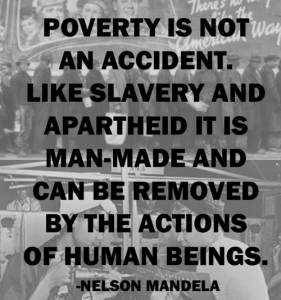 The flip side of Mandela’s observation here is that the fight to eliminate poverty can be impeded by human beings, though it is typical of him that he stated the more positive form. As we ask ourselves what are the human motivations to perpetuate poverty, after casting about for the villains and scoundrels who must be to blame, we would do well to remember that the capitalists are mere boogy men, the bankers and lawyers and politicians and military-industrialist-media moguls and CEOs and such are mere symptoms of the disease within us all.